I was lucky to get Cartoon Network as a kid and I loved Dexter's Lab, Johnny Bravo, Cow & Chicken and I Am Weasel. Uncle Grandpa is the next logical step in the evolution of silliness. I really love the whole concept of this show. It's the first show whose point is it's pointlessness. The gags are so incredibly bad that they're brilliant again. The characters have a great dynamic and the voice actors are really well-cast. The shows art is also very unique and artistic. 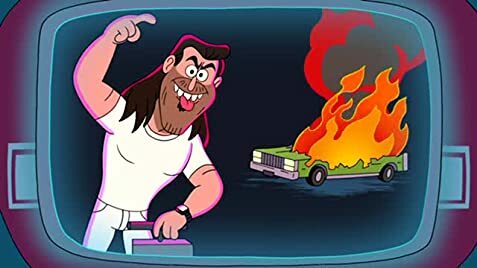 While shows like "Adventure Time" try to tell a message and make people think, which annoys me quite a lot, Uncle Grandpa is all about fun and the celebration of stupidity. I hope this show continues for a long time and stay true to it's pointlessness. Adam Devine (Pizza Steve) appeared on Workaholics (2011).